AIIMS MBBS 2nd Counselling 2018 – All India Institute of Medical Sciences (AIIMS) has released the notification for AIIMS MBBS Second Counselling 2018 which will commence on 11th August for the allotment of vacant seats available after the First Round of counselling, and for the change of Institute allotted in the 1st counselling. Candidates who appear before the counselling committee in the 1st round of counselling on being called on their turn for the allotment of seats becomes eligible for the 2nd round of counselling. Therefore all the eligible candidates who are eligible for counselling can now get here details of AIIMS 2nd Seat Allotment and get to know about their allocated seats. Thus the AIIMS 2nd Counselling Process will include a number of subsequent rounds which details you can check below. All India Institute of Medical Sciences conducts the counselling session every year for admission in MBBS courses in the seven AIIMS institutions across the country. Therefore candidates who qualify the AIIMS MBBS entrance as per the required cut off marks are called for counselling. The authority has already conducted AIIMS MBBS 1st Counselling in the month of July and has recently released AIIMS MBBS 2nd Counselling Date 2018 which will be conducted for allotment of vacant seats available after the First Round. Therefore applicants whose name appears in AIIMS 2nd Merit List becomes eligible for the counselling process. The counselling process includes a number of steps such as choice filling, document verification, fee payment etc. Therefore during 2nd counselling round candidates will need to furnish original Certificates and documents which were produced during the 1st round of Counselling. 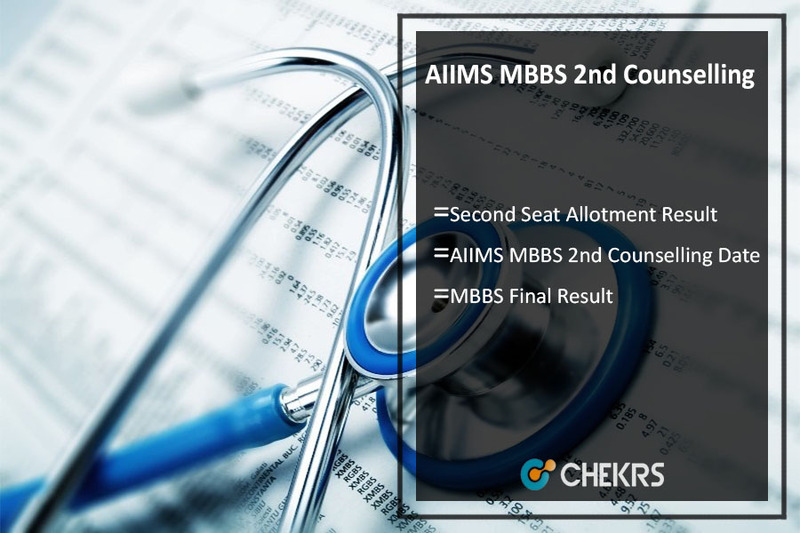 Below you can get the details of AIIMS MBBS 2nd Counselling Schedule as declared by the authority and get to know about each event more precisely. Candidates must report to the allotted institute on the specified date. Candidates who are attending 2nd counselling but have already admitted in any of the AIIMS must bring “Statement of Certificate” by the respective AIIMS to enable them to participate in the 2nd round of counseling. All those students, who will bring the Statement of certificate and opt seats in the 2nd round of counseling must have to bring the original certificates and deposit the same before they are admitted to their chosen AIIMS after the second round of counseling but before the last date of admission at respective AIIMS. At the time of 2nd counselling, all candidates will be called as per their merit for UR seats thereafter candidates belonging to OBC/SC/ST category will be called as per their merit as done in the first round of counselling. At the end of counselling applicants need to pay the required amount and confirm their seat. All India Institute of Medical Sciences (AIIMS) is going to conduct AIIMS 2nd Counselling 2018 on 11th August. Therefore applicants who were not allotted seats in the first round and those who want to change their allotted seats of 1st counselling have to appear for the second counselling process. Thus at the end of counselling, the authority will release the results of AIIMS MBBS Second Seat Allotment Result on the basis of merit, category, choice, and availability. The authority will publish the results through AIIMS 2nd Counselling List through its online portal and we will also update you here with the same. For more updates stay tuned to our portal. Incase of any query or review place your comments below.